Climate is changing at unprecedented rates in recorded history. A variety of lines of evidence demonstrate that climate change is likely to affect the hydrologic cycle and thus create new challenges in water management. This requires that climate change information be included in water and water-related resources planning, operations, and management. Climate and Water Resources Management, Part 1: Climate Variability and Change describes the terminology, global evidence, regional manifestations, and basic science of global climate variability and anthropogenic change, with a focus on water resources management. The lesson presents this information using rich graphics, animations, and interactions. Key messages are highlighted from the 2014 National Climate Assessment, produced by the United States Global Change Research Program. 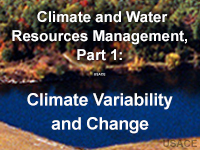 The intended audience for Climate and Water Resources Management, Part 1: Climate Variability and Change includes managers and professionals working in water resources planning under variable and changing climates. This includes people who are somewhat removed from the implementation of climate change policy, but still need to be conversant in the topic. One of the questions within the quiz asked what would cause short term (<10 year) climate variability. The tilt of the earth relative to the sun was one of the correct answers, while milankovitch cycle was not. I think the answer could be more clear, as obliquity, the magnitude of earth's tilt in relation to the sun, is one of the 3 components to the milankovitch cycles. This course is very awesome and well presented! To be honest, I wasn't really conscious on what is currently happening to our environment. This course (thanks to our Water Resources course professor who introduced this to us! ), is an eye-opener for me to understand well the possible effects of climate change and hopefully, be able to take a useful action because climate change is not a joke. I liked that I could do the lesson in short bites. Leave it up on my computer and come back to it. I like the use of graphs and the tools to explore the graphs. I would have liked a few more images illustrating the examples in some of the lessons. MetEd is an awesome platform! This was a great lesson overall! Very interesting and illustrative presentation with a lot of interactive graphs and charts. Overall, very informative and thorough. Thank you for this most informative course. Great course for someone interested in learning more about weather.